What is Wear Blue for Kindness Day? 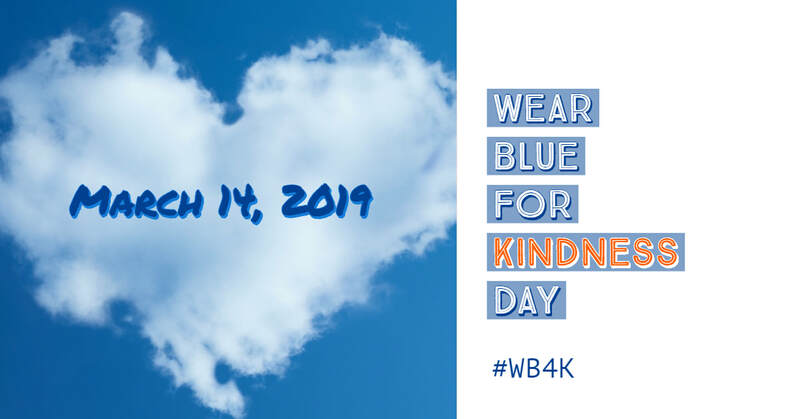 Wear Blue for Kindness (WB4K) Day began in 2018 as a response to the growing acts of violence in our schools. The McAuliffe PTSA wanted to engage our elementary school students in an age appropriate way to help them learn and express empathy and kindness for everyone. With the help of the school staff, the school district and the Lake Washington PTA, we created a day for students to wear blue (the color of peace), perform random acts of kindness, look out for those who are lonely and reach out to make new friends. The 2018 event was shared across the district and many schools around the state participated. We even had a school from another state join in! ​Our PTSA President and school principal were even interviewed about the event for a KIRO 7 report about school events happening that day. Our Mayor, Christie Malchow, will read a new city proclamation declaring March 14th as Wear Blue for Kindness Day in the city. This movement started right here at McAuliffe Elementary with the help of our Executive Vice President, Sarah Hawes Kimsey. Lake Washington School District and schools throughout the area have adopted the day and we couldn't be more thrilled! If you can, we encourage you to attend the Sammamish City Council Meeting and wear blue to help support this amazing accomplishment. Join us on March 14th by wearing blue, reaching out to others and teaching our kids to be their best for themselves and others!